Ford has said it will cancel a $1.6bn (£1.3bn) plant it planned to build in Mexico and instead extend operations at its factory in Michigan. The US car giant will spend $700m on expanding the plant at Flat Rock. Ford boss Mark Fields said the decision was partly due to falling sales of small cars and partly a “vote of confidence” in Donald Trump’s policies. The President-elect has criticised both Ford and its rival General Motors over production of models in Mexico. Mr Trump earlier on Tuesday tweeted criticism of GM’s production of its Chevy Cruze model in Mexico. Ford’s chief executive, Mark Fields, that the main decision to cancel the plant in Mexico was because of a “dramatic decline for the demand for small cars here in North America,” allowing the company to cope with its existing plant. But he said another factor in the decision was the “more favourable US business environment that we see under President-elect Trump and some of the pro-growth policies that he’s been talking about”. “That did play a part and it’s a vote of confidence that he can deliver on these things,” Mr Fields added. Ford is not abandoning production completely in Mexico, but is switching production of its Focus model to its existing plant in Hermosillo there to improve profitability. It makes the current version at its plant in Wayne in Michigan. Production at that facility will switch to two new models, which it says will safeguard 3,500 US jobs. The planned $1.6bn plant in Mexico was to be built in San Luis Potosi, but Ford said it would now invest some of that sum in Flat Rock, creating 700 jobs building a range of electric cars. Mexico’s economy ministry said it regretted Ford’s decision, adding that it had assurances that the US car firm would pay the state of San Luis Potosi for any costs incurred from the cancellation. Earlier on Tuesday, Mr Trump criticised General Motors on Twitter for making cars built in Mexico and made available tax-free in the US. 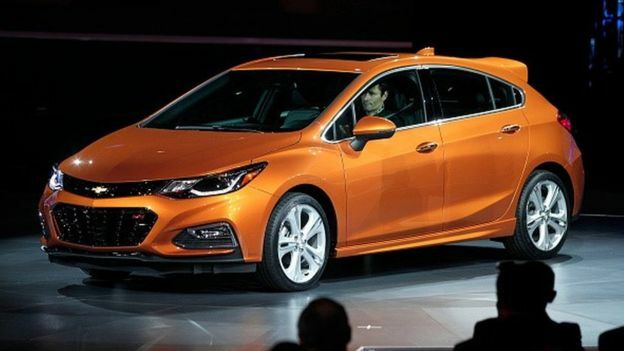 “General Motors is sending Mexican made model of Chevy Cruze to US car dealers-tax free across border. Make in U.S.A. or pay big border tax!” he tweeted. However, GM said most of its Chevy Cruze cars were made in the US. A spokesman said only the hatchback model, which forms a small percentage of sales, was made in Mexico. He added that the car was built there for global production and said that although some Cruze sedans were made in Mexico for a while last year, all the ones now sold in the US were manufactured in Ohio. Cars made in Mexico can move across the border tax free thanks to the North American Free Trade Agreement (NAFTA), something that Donald Trump attacked during his campaign for causing the loss of US manufacturing jobs to cheaper labour. In fact, only a tiny fraction (2,400 out of 190,000) of the GM model he singled out, the Cruze, are made in Mexico. But while he may have picked on the wrong model, the message was unmistakable – the President-elect’s hostility to NAFTA hasn’t faded post-victory. That position – and its popularity among many US consumers – is clearly not lost on car makers. Glenn Johnson, president of a union at the Lordstown factory in Ohio, said there had been no protest about the move of sedan production across the border. Mr Trump has criticised other US industry titans since his election win and has vowed to make good on campaign promises to bring jobs back to America by, as he puts it, levelling the playing field. However, some commentators have expressed concern that restricting imports could damage the US economy. In November, GM said it would lay off around 1,250 workers at Lordstown and around 800 at its plant in Michigan from the middle of January, although some may find work at other factories.